"James Grabill has always been at the forefront of ecologically concerned poets, finding the information we need, and speaking as a steward for the natural world. In 'Living with the Stern Review' he says 'Even a gnat's dust plants a seed and takes back life.' And then he warns us: 'What our ancestors believed was endless has come circling back around us.'" 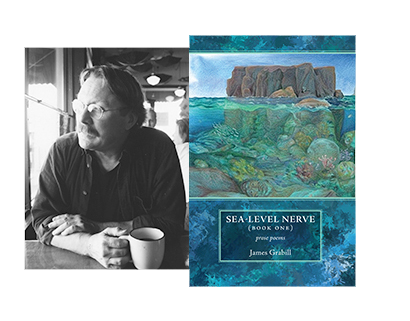 "In Sea-Level Nerve James Grabill takes the mico and macro observations of science--in other words, every being and phenomenon in the universe--and pulls them together into a great vision. His unique lyricism is one of the brilliant lights of contemporary American poetry." JAMES GRABILL has published seven books of poems, two books of essays and two poetry chapbooks. Poem Rising Out of the Earth and Standing Up in Someone (Lynx House, 1994) won the Oregon Book Award for Poetry. Three other volumes have been finalists for OBA: Through the Green Fire (Holy Cow! Press, 1995) in creative nonfiction, Listening to the Leaves Form (Lynx House, 1997), and An Indigo Scent after the Rain (Lynx House, 2003) in poetry. Now semi-retired, Grabill channels his energy into writing projects and public presentations. He continues to teach "Pathways to Sustainability" at Clackamas Community College. He lives in Portland, Oregon.